Most of our vegetables grow in neat rows inside the garden fence. But not everything grows neatly. Spinach, lettuces, Swiss chard, beets, radishes and carrots stay where they are planted and are harvested while under 2 feet tall. But then there are are the sunflowers, the squash and the pumpkins. Sunflowers can grow to 15 feet tall, and we love the massive flowers that top them, and so we grow them every year. 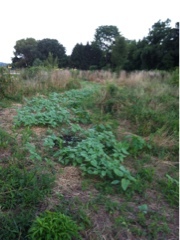 Pumpkins can spread the same amount across the ground, creating an impenetrable blanket that has an impressive run. We have learned to plant both of these outside of the usual vegetable bed areas. This year they have their own wide and long run, where the height and breadth will not shadow out others. On these days of long sunlight the growth is impressive, inches each day. A week from now this area will look entirely different!